Blind and partially sighted visitors are invited to an audio description and handling session in Tate Britain’s garden project, A Common Ground. A Common Ground will transform Tate Britain’s front lawns into a working garden for the stomach, soul and society. Using sensors, voice recognition and sculptures, the garden is designed to instigate sociability – talking will trigger fountains to flow and structures will gently shepherd people together. The aim is to make you feel at ease and to encourage conversation and connections with strangers. 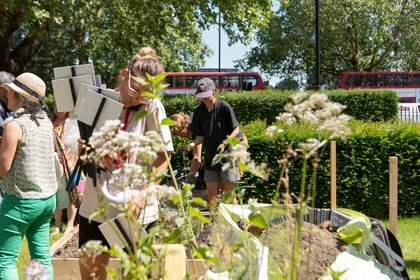 The plants, vegetables, herbs and flowers in the garden have been chosen to reflect multicultural London today, and highlight the unexpected ancient origin of plants and how they’re used in modern-day cuisines. Join the Tate Britain team at the Manton Studio for Refreshments at 10:30 am. The Tour in the galleries will start at 11 am.